One point that rang out loud and clear, and has consistently since Kathleen Wynne’s appointment as Premier, is that she understands she needs the opposition in order to govern. While anyone who has the ability to count can recognize this is the reality of being three seats short of a majority, it is a message Dalton McGuinty did not fully accept; which, to some degree, hastened his need to prorogue the legislature before losing the government altogether. PC Leader Tim Hudak has made it clear he has no intention of working with this current government, leaving NDP Leader Andrea Horwath as Wynne’s only potential partner. Last Monday, Kathleen Wynne took her message of cooperation, and confidence that she and Horwath will be able to work well together on job creation, to her nearly 16,000 followers on Twitter. 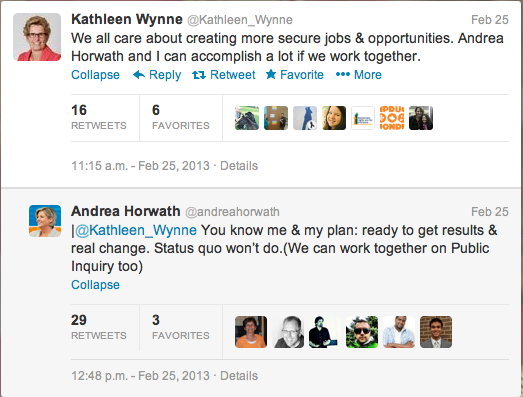 What is fascinating about this exchange from my perspective is the fact that Andrea Horwath, at least, is using social media to engage and respond to another party leader about live discussions that are surely happening behind-the-scenes at Queens Park. Gone are the days of private discussion and debate with minimal (if any) public knowledge, observation, or input. Today’s politics are conducted not only in government offices and halls, but also on the public stage as tens of thousands (often even more) look on and even respond and engage should they so choose. Twitter has brought down walls and closed the distances between individual politicians, their political parties, and the general public. No longer are statements, challenges, and invitations made solely through “official” channels—instead, they can be made and responded to in moments via avenues such as Twitter. (Seemingly) real communication can happen anytime, anywhere. It will be interesting to see how long this minority government survives. To date, the NDP have only agreed to pass the Throne Speech, and with a budget vote expected in the next few weeks, Wynne might find herself having to do a better job of engaging Andrea Horwath going forward.